Full Tuition and partial scholarships. Depending on the Student type of Scholarship (McKay or Step Up) and the matrix, the monthly payment may vary. All payments must be received during the first week of the month. If no payment is received, by the 5th day of the month a penalty of 5 dollars weekly will be charged to the studen'ts account. If parents are not capable of making a monthly payment or full payment, it must be notified in written to the office so the school board will make a special billing arrangement. If no notification is received from parents, and billing attempts has being issued, students will not be allowed to received their transcripts, diplomas nor promotions. All school dues must need to be paid by the end of the first week of June. You should register before the new school year starts. The school has a year round enrollment but its always better to know how many students we have for each classroom prior to the new school year starts. You will get 2 chances to re-enroll with a special school discount. Those who re-enroll prior to April 30th ,will get a $100.00 discount from their registration fee. Those who re-enroll prior to May 30th will get a $50.00 discount from their registration fee. What is Mckay Scholarship, how does it helps me? Florida's school choice programs ensure that no child will be left behind by allowing parents to choose the best educational setting—public or private—for their child. 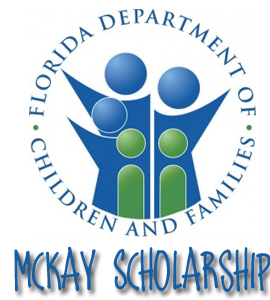 The McKay Scholarships for Students with Disabilities Program provided over 26,000 Florida students with special needs the opportunity to attend a participating private school during the 2012-13 school year. The McKay Scholarships Program also offers parents public school choice. A parent of an eligible special needs student may choose to transfer the student to another public school.